I've been at it again, trying to invent reasonably healthy recipes that actually taste good. 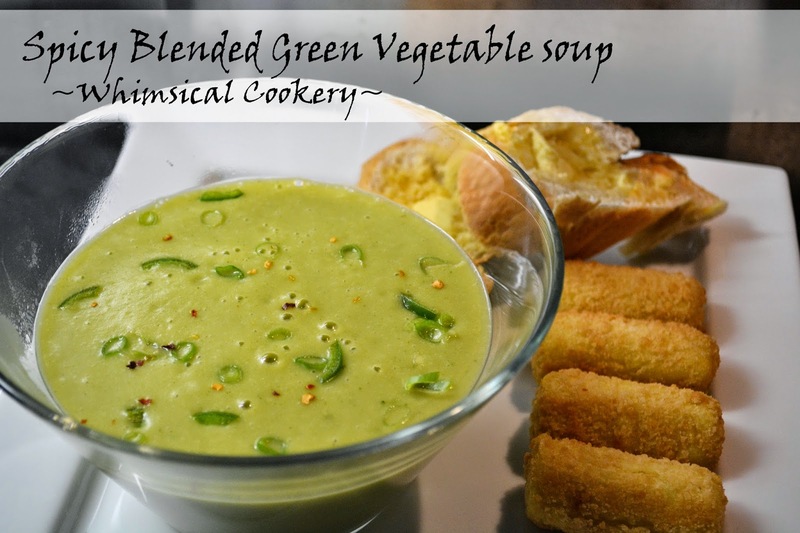 My husband agrees, I have hit the nail on the head with my spicy blended green veggie soup! This soup uses potato and veggies as thickener instead of a roux or cream. Health! Great recipe for picky eaters as well, no bits if you leave off the garnishes that do not suit your tastes. 1. Wash and peel potato, chop into chunks and set aside. 2. Slice one clove of garlic and set aside. 3. Wash spring onion, celery, broccoli, and chili. 4. Slice celery, spring onion, and broccoli into large segments, set aside. If you'd like spring onions as part of a garnish for the soup, thinly slice a couple of the segments and set aside from the rest of the vegetables. 5. Mince or cut green chilies into sliver-thin strips. Set aside any you would like to use as garnish. 6. In a medium pan, heat oil and fry garlic and celery until fragrant. 7. Add water, potato pieces, spring onions, broccoli, green chili, and peanut butter. 8. Boil, covered, for 10 minutes or until vegetables are tender. 9. After 10 minutes, remove some of the soup water (about 1/2 a cup is fine) and dissolve the chicken stock cubes before returning the soup/stock mix to the pan. Stir and remove from heat. 10. Add soup to blender (or use hand blender) to blend soup smooth. 11. Serve hot. Garnish with spring onions, chili slivers, and red pepper flakes to taste.